"At Bakery On Main, we're all about better health and happy tastebuds living together in harmony. We hope you love our premium gluten free granola products as much as we love creating them for you. It all started in the small bakery of a natural foods market on Main Street in Glastonbury, Connecticut. Founder Michael Smulders listened to his Celiac customers complain about the taste of many of the gluten free options available to them. He thought that no one should have to suffer because of a food allergy or other special dietary need, and made it his mission to create products that were good for them but taste like they aren’t. Late in 2003, after tasting a granola recipe one of the bakers was working on, Smulders said, “these gluten free people need granola!” He walked through the store and gathered ingredients and baked the first batch that day. It took almost 2 years to find gluten free sources of all the ingredients and find a place where we could make the product without risk of cross-contamination. Three years and two bakeries later, their gluten free granola is made in a 34,000 square foot manufacturing facility with state of the art quality controls and in-house gluten testing on every batch. Located just a few miles down the road from the original bakery, the plant maintains the small bakery quality by continuing to bake in small batches." "We gently toast corn flakes and rice crisps with sesame, sunflower, and flax seeds into golden clusters of crunchy goodness. Then we add plump cranberries, almonds and pecans for a delicious snack or breakfast cereal." "A taste explosion of almonds, Brazil nuts, pecans, walnuts, filberts, cranberries, raisins, coconut, and apricots all mixed with our trademark crunchy corn, rice and seed clusters." "Delicious cinnamon toasted corn and rice clusters with tart unsulphured apples and plump raisins make a great start for your busy day. Made with unrefined sugar and Non- GMO expeller pressed canola oil." "These delectable bars are just the right combination of chewy, crispy, chocolatey and peanut-buttery goodness." "Made with real apples and cinnamon, it's like apple pie on the go - that just happens to be as good for you as it tastes..."
"Made with certified gluten free oats and plump juicy raisins. Getting enough fiber can be hard on a gluten free diet, but starting your day with our delicious new Fiber Power gluten free granola can make it easier – with 9 grams of fiber per serving, you’ll get about a third of the FDA’s recommended daily fiber intake." "Made with certified gluten free oats and freeze dried raspberries, strawberries and blueberries. Getting enough fiber can be hard on a gluten free diet, but starting your day with our delicious new Fiber Power gluten free granola can make it easier – with 9 grams of fiber per serving, you’ll get about a third of the FDA’s recommended daily fiber intake." "Give the gift of happy taste buds! This boxed set is the perfect gift for your gluten free friends and family (or even for yourself). Inside you'll find an eco-friendly reusable Bakery On Main tote bag, 1.5 oz gluten free granola snack packs of our Apple Raisin Walnut, Nutty Cranberry Maple and Extreme Fruit & Nut flavors, 2 oz. Fiber Power gluten free granola snack packs of our Triple Berry and Cinnamon Raisin flavors, and 1.2 oz gluten free granola bars in our Peanut Butter Chocolate Chip, Cranberry Maple Nut and Extreme Trail Mix, plus a $0.50 off coupon." What we thought: I was a little skeptical at first because I had never heard of oatmeal-free granola, but thanks to Bakery On Main, those who are on a GF diet and have had to stay away from granola can now snack on these yummy treats to their heart's content:) And after tasting them, they might just become a regular part of your diet! They come in a variety of delicious flavors and either loose granola or granola bar options.. 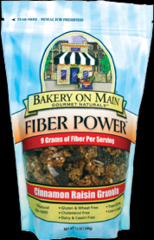 The Fiber Power granola has that added punch of fiber, a very necessary part of everyone's diet. These snacks were loved by everyone in our family. I loved the portability of the granola bars and the amazing flavor combinations of the loose granola. 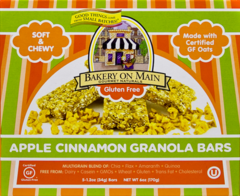 Bakery On Main granola products are a healthy (but super tasty:) snack option for everyone, young and old, whether you are on a GF diet or not:) ABCD Diaries gives Bakery On Main snacks an A+! Buy It: Find these awesome gluten-free snacks at Bakery On Main!! Giveaway ends Tuesday, January 1, 2011 at 11:59cst. Winner will be chosen via random.org and emailed. They will have 48 hours to reply. This giveaway is offered to US residents only. Disclosure: ABCD Diaries was given variety of Bakery On Main products for review purposes only. We were in no other way compensated. The opinions expressed in this post are ours and ours alone. I think the extreme fruit and nut granola sounds really good. I would say the apple cinnamon granola bars. Apple Raisin Walnut Granola is my choice! Thanks for the chance! I would love to try the extreme fruit and nut granola. Thanks! The peanut butter chocolate chip granola sounds good. I'm most excited to try the Apple Cinnamon Soft & Chewy Bars! We'd like to try the triple berry fiber power granola. I'd most like to try the Cranberry Orange Cashew Granola. 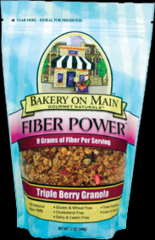 The Triple Berry Fiber Power Granola sounds delicious, and healthy! I most want to try the Extreme Fruit and Nut Granola. Oh drool! They all sound fabulous. I'd probably go for the Triple Berry Fiber Power Granola first and then work my way thru the rest! I am most excited to try the Peanut Butter Chocolate Chip Granola Bars--they sound so yummy! The Extreme trail mix sound great. The snack I'd most like to try is the Chocolate Almond Soft & Chewy Bar. 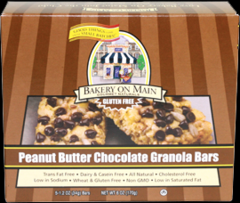 Liked Bakery OM on FB as Judith B.
I would love to try the Chocolate Almond Soft & Chewy Bars! I follow Bakery On Main on twitter! I would like to try the Apple Cinnamon Soft & Chewy Bars. I want to try the Peanut Butter Chocolate Chip Granola Bars - they look yummy. I entered the snapware giveaway! I entered the Ruth's brownies giveaway. I follow on GFC! I would like to try the peanut butter chocolate chip granola bars! entered tortuga rum cake giveaway! I would like to try the power granola. I'm excited to try the peanut butter chocolate chip granola bars! Would love to try apple raisin walnut granola. YUM! Also, I entered the giveaway for Ruth's Brownie Kitchen. Thanks! !